The tennis committee helps grow the awareness and participation of residents in the neighborhood. The tennis committee meets to review the current rules, maintenance needs, participation and local involvement in the community. We’re always looking for new captains and players. Brookshire sports 8 hard-surface tennis courts. The courts are open for residents and their guests all year-round. To reserve a court, simply sign in at the sign-up sheets located on the sign outside Court 3/4 (at the top of the hill). Reserving a court isn’t necessary, but a reserved court takes precedence over walk-ups. Individual and team tennis opportunities about here at Brookshire. Currently, Brookshire fields women’s and men’s ALTA teams, ALTA mixed doubles teams. We also have men’s, ladies, and mixed USTA teams which compete all year. Men’s and Women’s ALTA teams have won multiple City Championships – and are always in the hunt for division and city titles! If singles is your thing, there are several men’s and women’s singles leagues around metro Atlanta. The largest and most popular is Ultimate Tennis (formerly K-Swiss). There is also Peach Tennis, Visionary Tennis, League Tennis and others. Doubles players have plenty of options as well. 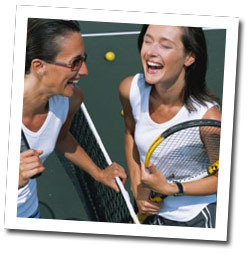 T2 Tennis is the most popular option for Doubles in and around Atlanta. There is also League Tennis. But if you are into team doubles action – please visit USTA or Atlanta’s own ALTA (Atlanta Lawn Tennis Association).